En general, es poco lo que sabe de la tecnología y el armamento Vanduul pese a que el conflicto con los Vanduul dura ya más de dos siglos. Los esfuerzos de infiltración de los servicios de inteligencia imperiales a lo largo de este tiempo han fracasado una y otra vez. Toda la información que se tiene sobre los vanduul se ha conseguido gracias a la reciente captura de una de sus naves capitales, denominada X12. En su interior se encontraron 300 cazas Scythe de los que sólo un centenar eran operativos. Del análisis de estos cazas se han obtenido los valiosos datos que este informe presenta. Six months ago, a United Empire of Earth picket lucked into a true prize: a Vanduul carrier-ship, henceforth referred to as X12, dead in space off Garron. Later analysis suggests that the warship suffered a disastrous engine failure which flooded much of the crew quarters with deadly anti-matter radiation and left the survivors unable to follow the standard Vanduul protocol of self-destruct when threatened with capture. A detachment from the 8th UEE Marine Division boarded the ship and was able to subdue the remaining crew with relative ease. Although no Vanduul survived for interrogation, the ship has provided a wealth of potential information about their culture and habits. What follows is an initial report. The ship in question seems to belong to the Goran horde. We now hesitate to use the term clan to refer to Vanduul warrior-hordes because an extensive mitochondrial DNA analysis of material recovered from X12 suggests a wide range of genetic diversity. This raises a host of interesting questions about the unseen center of Vanduul society. We have known almost since their initial discovery by Earth forces that Vanduul are as likely to engage in warfare between hordes as they are with other species, but it is now an open question by what method these hordes are formed. Military anthropologists suggest that there may be a convocation of sorts in which war parties vie to recruit the best and strongest members for their banners, though this is largely speculation at this time. It is also possible that Vanduul spread out of a homeworld and form their hordes naturally. Notably, all bodies studied from X12 are male, further suggesting that there must be some central convergence of Vanduul groups where mating and other co-operative activities take place. Vanduul script seems to be both infrequent and crude. There is a unified system of quasi-pictographic writing located in brief segments throughout the ship, although the exolinguistic team at the University of Moscow tasked with its study has made absolutely no progress in discerning it. They have found no correspondence between it and spoken Vanduul language, and it resembles nothing so much as a cross between Egyptian heiroglypics and written braille. The ship does carry an excessive amount of video-based media, 95% of which is a single Vanduul speaking directly into a camera. Translation work is underway, although it is estimated to take several years with the available data; we have yet to unearth any kind of Rosetta stone for the Vanduul script. modern high resolution holography recordings used by all other known species. Since the general level of Vanduul technology is high and since they have raided more advanced species for generations, it is speculated that this is intentional and possibly a necessity coming from their uniquely structured eyes. X12 carried a crew of approximately 1,400 Vanduul. The vast majority of these were housed in a series of tightly packed racks clustered around the ship’s engine, and little from this area of the ship is exploitable. There are six apparent staterooms located in the bow of the ship, from which a variety of interesting artifacts have been recovered. Exploration of these personal quarters, believed to belong to the captain, first officer and top pilots, has first and foremost confirmed the Vanduul interest in trophies. Prizes seemed to be grouped culturally: one pilot (?) had dozens of Banu vases, another a small collection of Xi’an rings. The captain, chillingly, displayed dozens of bleached human arm bones on his walls. The culture significance is unknown, but as any privateer can tell you, the Vanduul are not traders. Onboard décor is unexpectedly varied. A major portion of the ship’s interior surface is exposed armor: Vanduul metals tend to have a tan hue, a result of iron impurities apparently present on their manufacturing worlds. Specific rooms, however, are painted with elaborate designs or artificial environments. One, colored with murals of pink-blossomed trees, appears to be a Vanduul recreational room, complete with gym equipment and a swimming area. Analysis of personal effects does confirm the importance of the knife to Vanduul culture. A large portion of the crew died grasping their elaborate yet functional knives. Metallurgical study suggests that all knives have a common point of origin, but that they have widely disparate manufacturers. There is some suggestion that individual Vanduuls construct their own knives (handedness musculature in autopsies match irregularities in knife construction in every instance). Knife imagery also appears throughout their media, with printed images of knives being common on the walls of personal quarters. One compartment, termed the “chapel,” feature elaborate stained glass images of knives (imagery which seemed to match the specific knife found in the quarters of the captain or chieftain). The warship itself was towed to Centauri Roads Naval Testing Station for further study. Naval engineers report that the damage suffered in the reactor explosion is too great to ever consider returning it to service. Externally, X12 is roughly equivalent to the UEE’s Indefatigableclass in tonnage. She is heavily armored, with that armor likely amplifying the damage suffered: the same layered system capable of protecting against an estimated three to four torpedo strikes also forced the internal explosion inward to the ship’s lower decks. 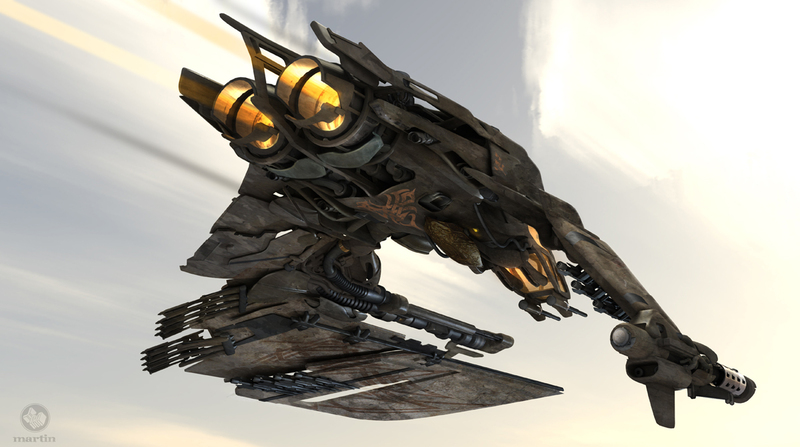 Internally, she carries an air wing more impressive than even a Bengal-class carrier: roughly three hundred of what have become known on the frontier as “Scythe” fighters (their UEE reporting name, Frank, has not caught on beyond the military services). Note that barely one hundred of these were combat ready; the rest were kept below decks as spares. During a full scramble, only a third of the total complement could be used. Per Senate request, the majority of these fighters have since been sold off to private enterprise to finance an important public works project, although Naval Intelligence continues to maintain a squadron for maneuver testing and potential covert operations. Esta entrada fue publicada en Especies Alienígenas, Mensajes del Espectro, Naves.